Completed my first year of BJJ and I popped my right knee while controlling an opponent during live action. I talked to my sports surgeon and he read the MRI as a torn ACL, still w/swelling after two months. I saw the MRI and couldn't see this tear. He advised me to strengthen the muscles around it and I might be able to avoid surgery. 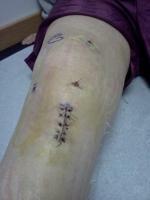 Compared to my opposite knee, surgery will only stabilize my injured knee one millimeter more. Hardly a difference, but instability and the thought of further damaging it concerns me greatly. Recovery time estimated at 12 months. I haven't been training since I cant fully bend my knee rearwards/behind me or sit on my heels without pain. So some positions would be hard to get into at the Academy. I can't tell until this pain subsides, and (it probably will in a few months) what my limitations will be strength wise without the surgery. I have some instability and it catches and it pops. My question is this: Does anyone think i can still maintain full strength/motion while grappling and avoid surgery ? lets face it i am not playing soccer or cutting up field with a football. its grappling. But i don't always want to be at a dis-advantage. Any thoughts or similar situations?